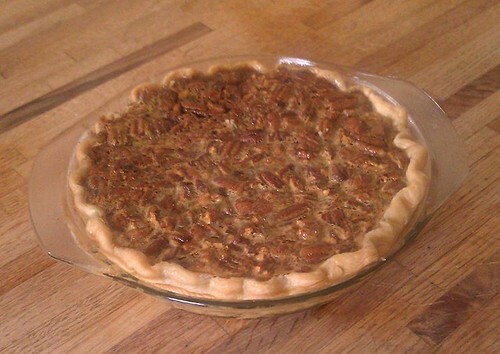 Pie crust for a 9-inch pie – unbaked. Prepare pie crust and flute edges. While I am able to make a pretty good pie crust from scratch, Pillsbury makes it easy on all of us with an excellent ready made crust. I use this kind most of the time. In a sauce pan, cook butter, sugar and corn syrup on medium to low heat until the sugar dissolves and the butter melts. Set aside to cool slightly. For filling: In a large bowl, mix eggs, vanilla, bourbon and salt. Whisk in the cooled corn syrup mixture to avoid cooking the eggs. Stir in the pecans and chocolate chips. Bake for 50 minutes or until the tip is golden brown. Cool on a wire rack.